Bronze | Batta bing, batta blog! I’m happy to report I’m here today with another home makeover post! We’ve been steadily working on different areas of the house. Parts are looking really awesome, parts still have a long way to go. 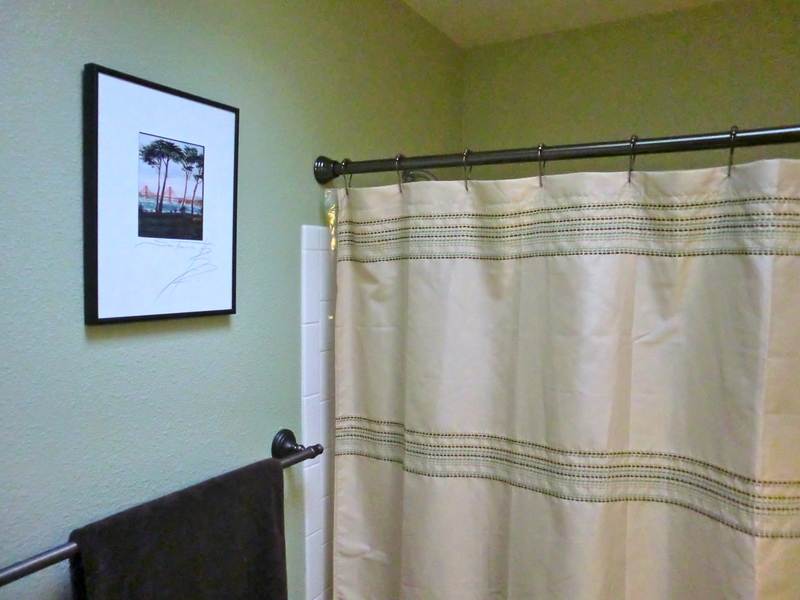 We’ve recently finished (for now) updating the guest bathroom. Our house is not terribly out of date, but it’s dated enough to make me go ewww 90’s, blech! 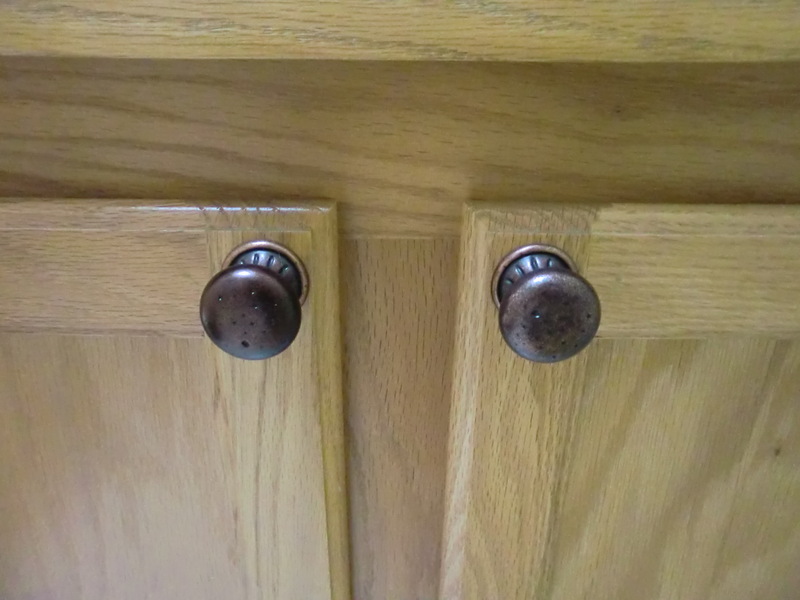 … the chrome hardware for all the towel bars, etc. The plainness of it all really bugs me — it’s all just so ugly and very unoriginal. On top of that, when we moved into the house they left everything in the bathroom as is. There was a fishy wallpaper border around the whole bathroom, fishy towel hooks glued to the doors, and the worst part… bubble and fish stickers glued to the walls, the shower tile and the front of the cabinet doors! UGH! How awful! The whole thing was way to fishy for us! We started by giving the whole thing a good cleaning! The bathroom was pretty gross. I think unless you live in the house you automatically think all bathrooms are gross. That’s how I felt, it could have been spotless and I still would have felt like it was dirty. We also spent a Saturday tearing down the wallpaper, cleaning off all the decals from the tile and cabinet doors and removing the uber sticky stuff from the doors where they had the wall hooks hanging. It was quite the chore. It made a huge difference simply doing that. 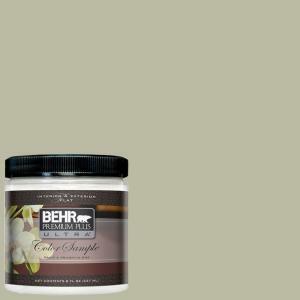 We chose to paint the bathroom “Restful” by Behr. It turned out to be a beautiful relaxing green. It’s very spa like, perfect for a bathroom. I recommend not painting a small bathroom this color as it could easily be too much color if it was a tight space. After painting, we decided the chrome fixtures needed to go. We replaced the towel bar and hand towel bar. 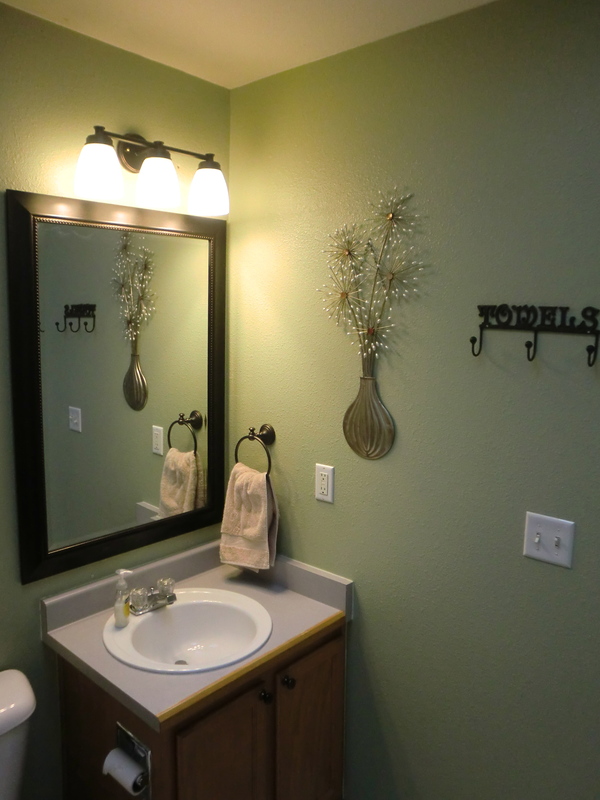 We also decided to replace the mirror and the light fixture for something more updated. I already had the shower curtain I wanted to use. I did, however, need to find wall art. I found a towel hook at Hobby Lobby on clearance for $3! What a deal! I also found the metal wall art next to the towel hook at Michael’s on sale. It fit perfectly and I’m so happy with it. I’m still on the hunt for a nice shelf or cabinet for above the toilet. We’ve got a bare spot there and I think a shelf would be nice. For now we are really pleased with the improvements that we’ve made to the bathroom. It looks much more welcoming and a lot less fishy than before. I’m also happy to report that this project came in well under $200! What a small investment for such a noticeable return! We still have hopes of replacing the flooring, the toilet and the countertop/faucet in the future. We already have the flooring picked out, we just need to get it and install it. 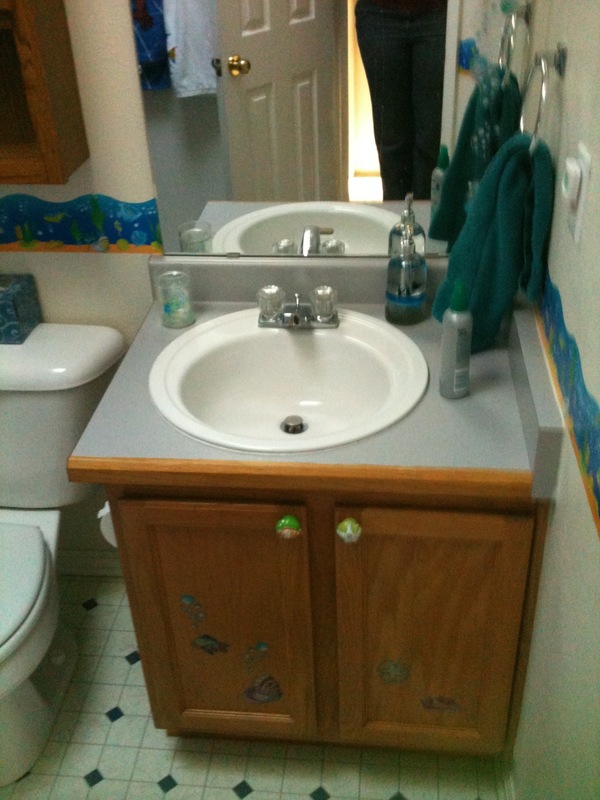 The countertop, faucet and toilet is somewhat of a pricey project. Those will have to be on hold until we can save a little cashola. It’s going to be very trying on me to put this on hold because the chrome faucet is driving me nuts! It certainly doesn’t go with all the bronze in the bathroom. Oh well. Good things come to those who wait. Right? What do you think of the new look? Any other changes or additions you would recommend?